The Yorkshire Museum has bought the second of two Iron Age torcs, believed to be the first jewellery from the era found in the north, following a successful public fundraising campaign. Natalie McCaul, the assistant curator of archaeology at the Yorkshire Museum, with the Brigante torcs. Generous donations from the public and funding bodies have allowed the second of two ancient torcs, both discovered at Towton, near Tadcaster, to be reunited with its sister ring at the Yorkshire Museum. Found by metal detectorists in 2010 and 2011, buried within metres of each other, the torcs represent the first gold Iron Age jewellery ever found in the north of England. They have been separated since the museum bought the first torc for £25,000 in January 2012. Builder Richard Mason was suitably underwhelmed when he dug up a grubby looking pot during a house renovation on Lindisfarne. Swinging the coil above the stalks was easier and quieter but still cost depth because you were detecting 8″ of empty air. In other words, you couldn’t win. Stubble needs to be either well rotted, so that it falls apart when the coil hits it, or very short, say no more than 3″, so you could swing over the top of it without sacrificing most of the detector’s depth. 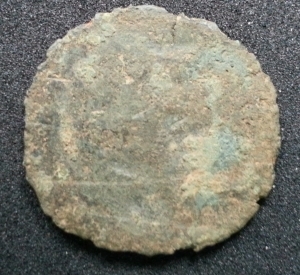 Within half an hour one person had found a Tealby penny but no other worthwhile finds were reported before lunch time. In fact the field was generally quiet, with very few signals and those there were seemed to produce only bits of lead, lumps of iron, coke, a few ringpulls, the odd horse shoe, lengths of aluminium tubing, bottle tops etc. To be fair I did find a monkey wrench and a very corroded 1″ diameter copper or bronze disk. In the field I assumed the latter to be a Georgian halfpenny or similar trade token but having properly cleaned it up and photographed it I fancy I can see the ghosts of a woman and child in it. Can anyone else see what I mean? In the afternoon, because so little had been found on the original field, a second one of some 90 acres of similar stubble was made available. Accordingly most people gave this field a try, but it too proved disappointing and was also quiet, producing the same assortment of rubbish as the first field. By the time I left at a little after 2pm the only other interesting find was a bronze item shaped like a frog or tortoise with ring-shaped markings on its back. If that and the Tealby penny are the sum total of actual finds for the day this will be hugely disappointing considering how interesting the area looked on paper. The question is whether there really is nothing there to find or whether the length of the stubble has been the problem. Finds: 1 corroded copper or copper alloy disk.